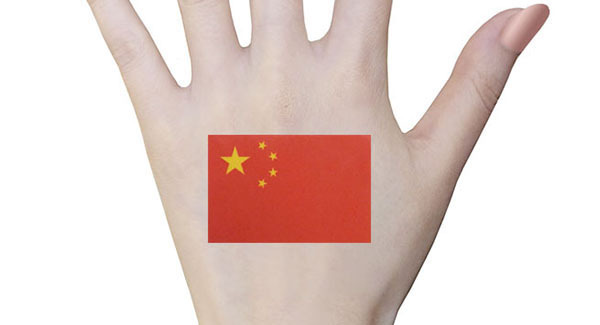 Chinese New Year is celebrated by 1/5 of the world’s population, and is a vacation week in China, Hong Kong, Macau, Indonesia, Philippines, Vietnam, Korea, Malaysia, Taiwan, and Singapore. Although Chinese New Year takes place in the middle of winter, it is also known as the Spring Festival because it marks the end of the coldest days of winter. 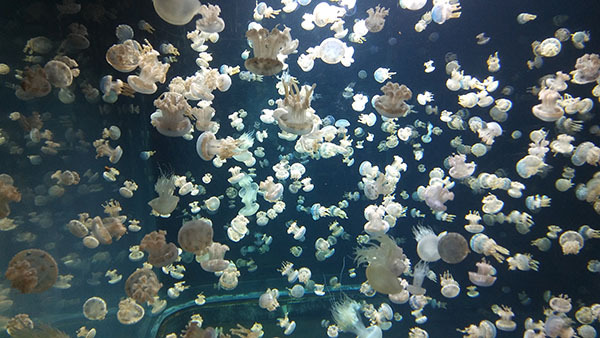 It is a time of new beginnings and fresh starts, when Asians around the world settle their differences, make up, and reconnect with acquaintances of the past. 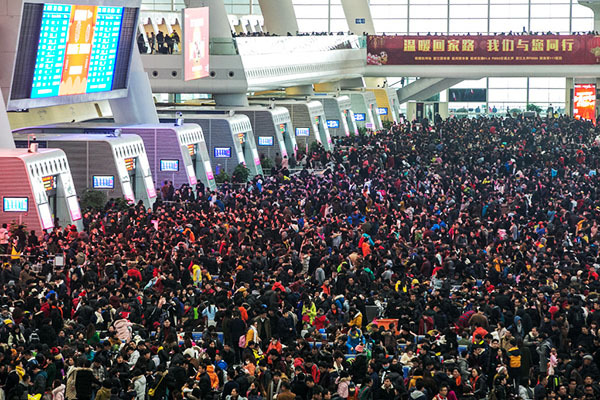 In the period leading up to Chinese New Year, China and other parts of Asia see extreme numbers of people traveling, taking a break from their work or studies to be with family for New Year’s Eve dinner. This well-known period, called “Chunyun”, usually begins 15 days before New Year’s Day and lasts for weeks afterwards. During this time, Asians take billions of trips by land, air, rail, and sea, in the largest annual migration in the world. Hangzhou East railway station located in Zhejiang, People’s Republic of China, began its operations in 1992 and was rebuilt as a high-speed rail hub in 2010. It’s now one of the largest railway stations in Asia. 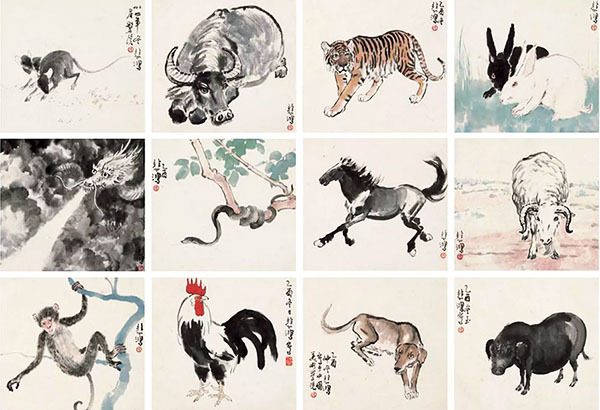 The Chinese Zodiac – Which Animal Are You? 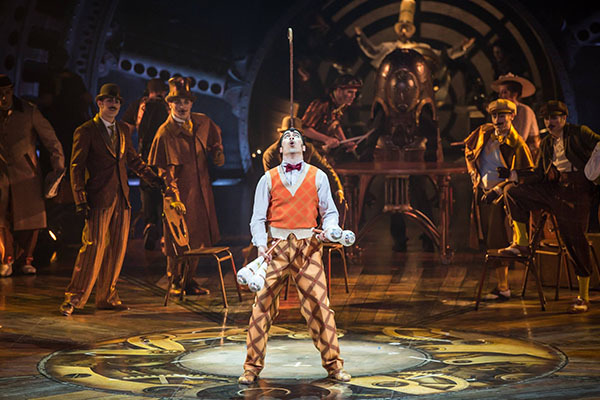 Year of the Rat: The Rat is generous, imaginative and charming. Year of the Ox: The Ox is conservative, confident, and a born leader. Year of the Tiger: The Tiger is sensitive, emotional and capable of great love. Year of the Rabbit: The Rabbit is kind, affectionate and pleasant. Year of the Dragon: The Dragon is a gifted perfectionist, enthusiastic and popular. Year of the Snake: The Snake is intuitive, deep-thinking and wise. Year of the Horse: The Horse is friendly, independent and hardworking. Year of the Goat: The Goat is artistic, elegant and charming. 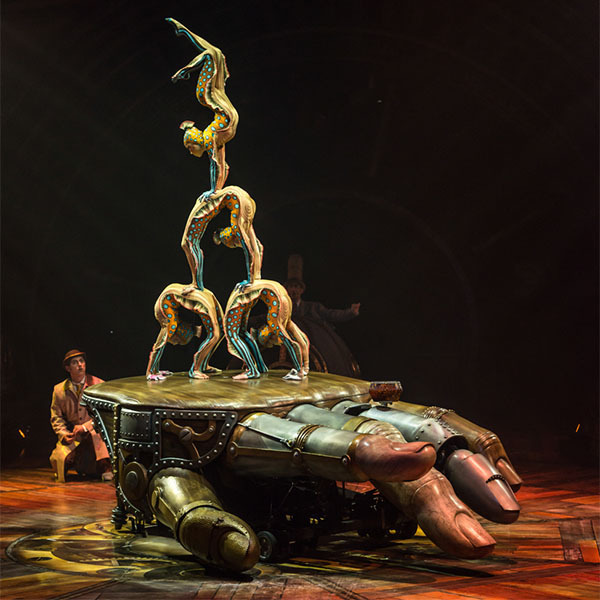 Year of the Monkey: The Monkey is intelligent, with a magnetic personality, and well-liked. Year of the Rooster: The Rooster is a dreamer, a decision-maker and a flashy dresser. 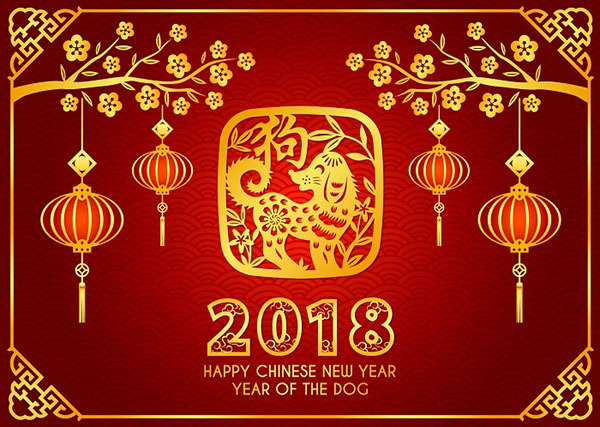 Year of the Dog: The Dog is courageous, loyal and heroic. Year of the Pig: The Pig is honest, sincere and tolerant. 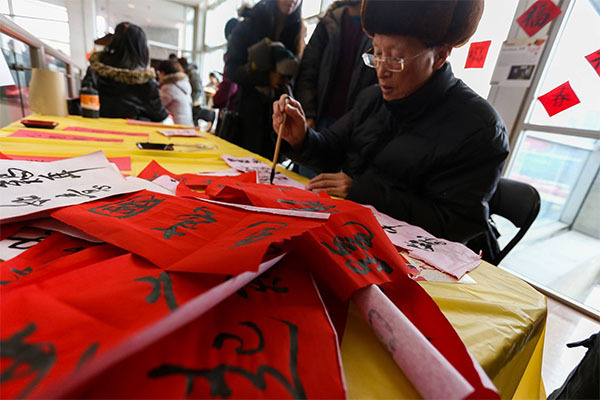 Gifts are exchanged during the Spring Festival and children receive red envelopes containing lucky money. 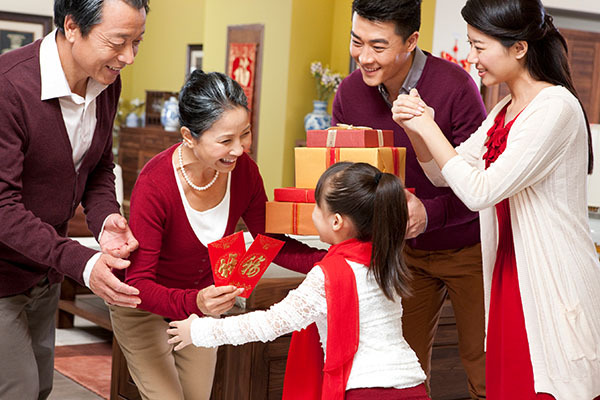 Giving red envelopes symbolizes the sharing of good fortune from the elders to the younger generation. Red envelopes are also given between friends, bosses, employees, and co-workers. 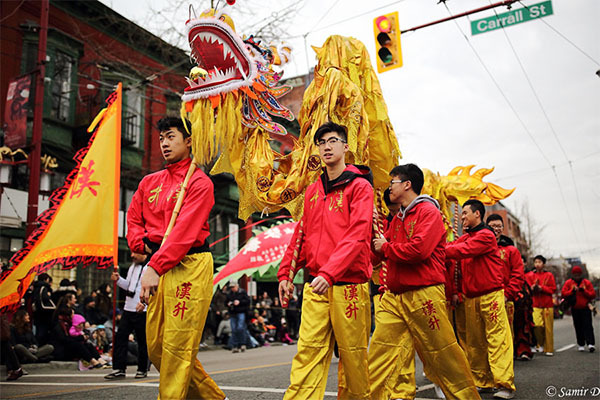 In Vancouver, there are a number of events planned, including the 45th Vancouver Chinatown Spring Festival Parade on February 18, and the Gold Ocean Lunar Fest Mingle 2018 on February 17th. Highlights of this event include a Chinese Couture fashion show, tea ceremony, waist drumming, and Chinese calligraphy. 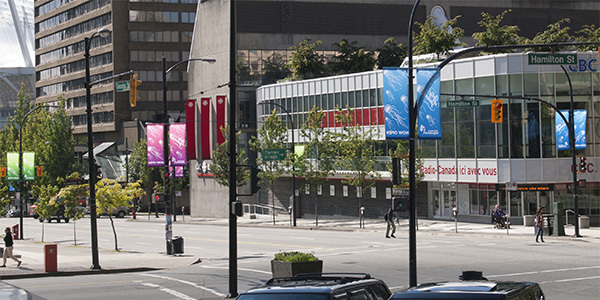 In Calgary, the Chinese Cultural Centre Association will hold its Chinese New Year Festival 2018 on February 17th and 18th. 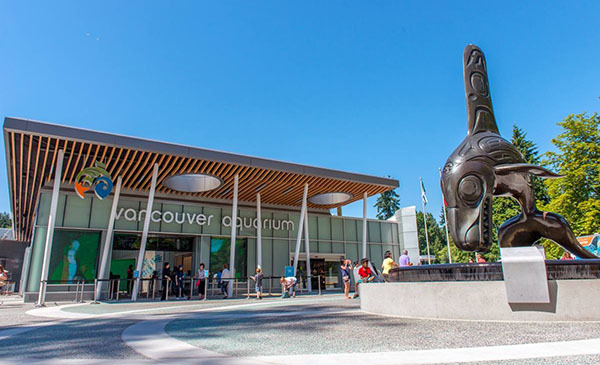 There will be something for everyone, including special performances of traditional lion and dragon dancing, martial arts demonstrations, and colourful Chinese lantern displays. 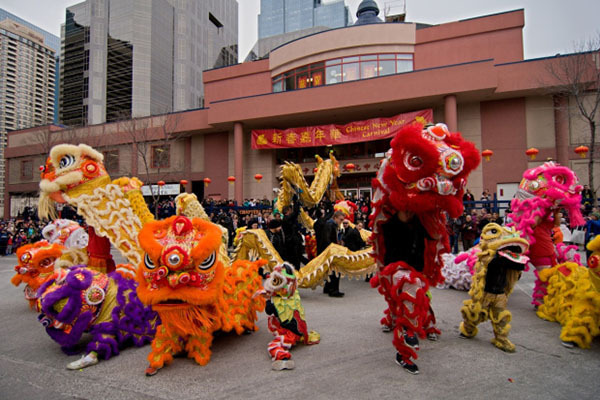 In Toronto, the Chinatown BIA will host its Chinese New Year Celebration on February 17th and 18th. The event promises traditional games, food, dancing, as well as fortune telling. 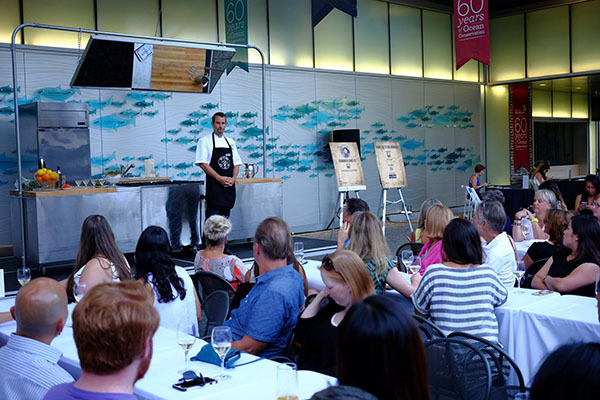 Planning your own event? We’d love to help! At The Flag Shop, we’ve been helping our clients celebrate Chinese New Year for over 45 years, with a variety of offerings to help you ring in the New Year! 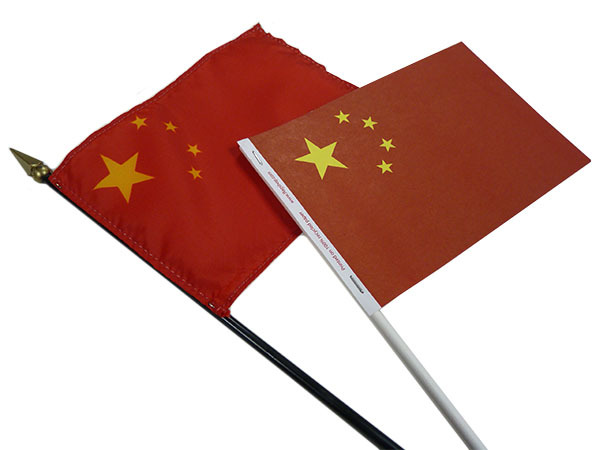 We carry many Chinese flag products, such as paper flags, stick flags, and tattoos. In 2017, Canadians joined together to celebrate one of the most important milestones in Canada’s history: Canada’s 150th birthday. Now that it’s over, some may wonder how we’re ever going to top such an amazing and important year. Everyone at The Flag Shop is pumped up about what lies ahead for 2018. Whether international, national, or regional events, there are so many things happening! 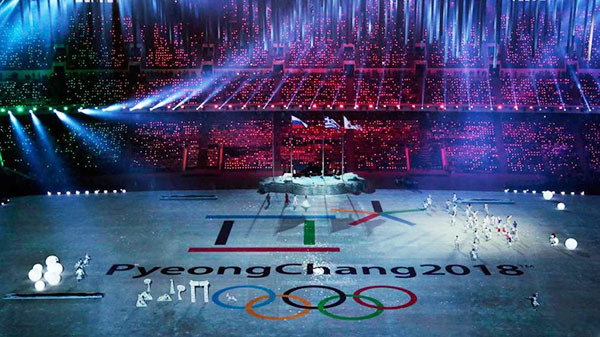 The 2018 Winter Olympics – officially known as the XXIII Olympic Winter Games – are coming up quickly in PyeongChang, South Korea. We all know the thrill of watching the opening ceremonies, and experience heart-pounding pride in our nation as we see our beautiful flag being waved on the world stage. 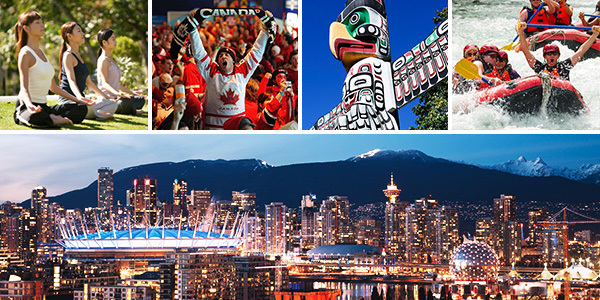 Get ready to cheer on the best of the best in winter sports, including figure skating, ski jumping, bobsleigh, snowboarding, and of course, Canada’s national winter sport: ice hockey. Predictions for the games include Team Canada bringing home a whopping 33 medals. Whether you’re rooting for Canada, Kosovo, Croatia or Korea, don’t miss your chance to wave your nation’s flag. Follow us on Facebook as we share updates and medals standings. For more information about the XXIII Olympic Winter Games, visit their official website. The Winter Paralympics – officially called the XII Paralympic Winter Games will begin a couple of weeks after the closing ceremonies of the Winter Games, and will include sports such as ice sledge hockey, biathlon and snowboarding. Throughout the games, there will be a total of 80 exciting medal events. For more information about the XII Paralympic Winter Games, please visit their official website. Whether you like to call it soccer or football, mark your calendars for FIFA World Cup, Russia 2018. Get swept up in the excitement of the games as 32 national teams participate in 64 matches, including two first-timers: Iceland and Panama. The games will reach a frenzied state of “FIFA Fever” leading up to the final match on July 15, at Luzhniki Stadium in Moscow. FIFA fan polls are purely speculative, but teams such as Spain, Argentina, Italy, Brazil and Germany are all believed to be contenders for the cup. Get your team’s flag on and join fans around the world as we all stand behind our favorite team! For match schedules and more, visit the FIFA World Cup – Russia 2018 official website. Top: Celebrating 100 years of Sea Cadets. Bottom: Niagara Falls Sea Cadets – 1947. Image Source: Navy League of Ontario – Ontario Division. In 1917, Reverend J. Russell McLean of the Ontario Division of the Navy League of Canada helped establish a group of Toronto Sea Scouts as a Boys Naval Brigade. This was the beginning of what is known today as the Sea Cadet Movement. The Navy League Cadet program aims to help young Canadians learn life skills such as team work, and leadership. 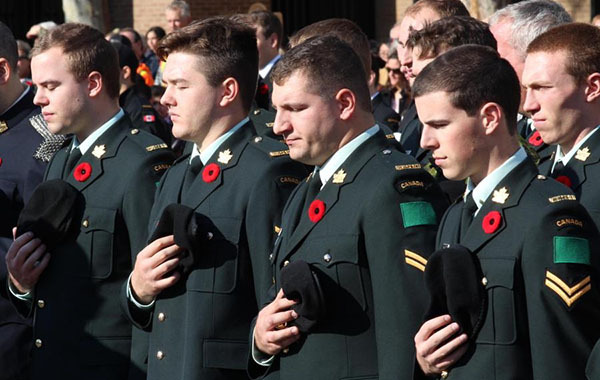 Today, there are more than 3,500 active Navy League Cadets in 102 communities across Canada. 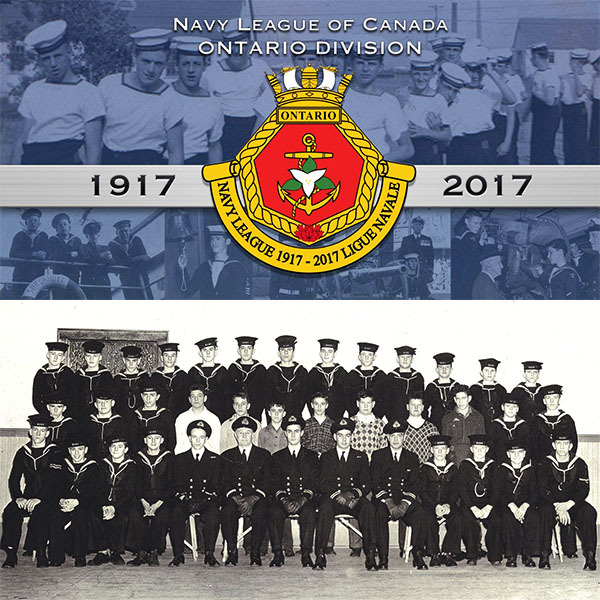 The Ontario division of the Navy League of Canada commemorated its 100th anniversary last year and final celebrations are planned to take place at its 2018 Annual General Meeting, in Markham, Ontario in April. 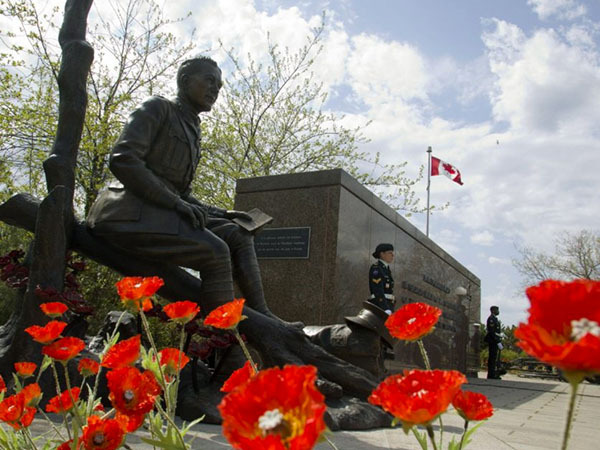 To learn more, visit the Navy League of Canada – Ontario Division website. 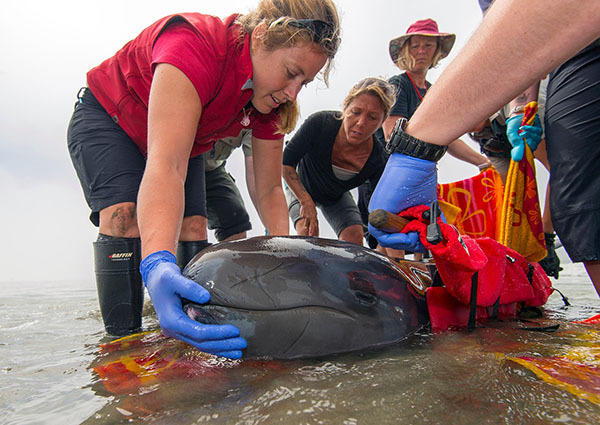 Stay tuned for our upcoming blogs, as we feature more exciting and important events as the year unfolds. As we wrap up our special “Home for the Holidays” series, we feature Kwanzaa, which takes place every year from December 26 to January 1. 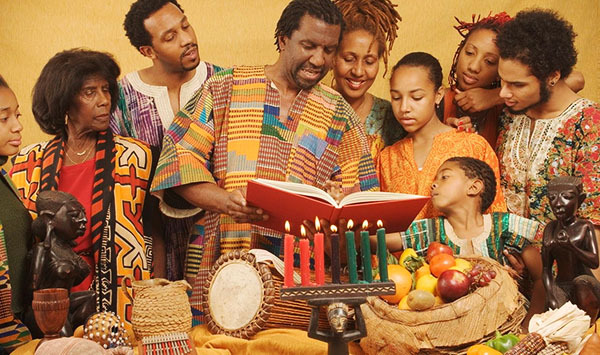 Kwanzaa is a week-long celebration honouring African traditions and cultural heritage. It was started by Maulana Karenga in 1966, following the violent Watts riots in Los Angeles, California. Karenga believed it was important for African Americans to have an occasion to commemorate their cultural heritage, and thus created Kwanzaa as an alternative to existing holidays. Kwanzaa is a Swahili word that translates to English as, “first fruits from the harvest.” Though Kwanzaa has roots in the Black Nationalist Movement, it has grown to hold meaning as a time for all people to reflect on and celebrate African American and pan-African traditions and heritage. 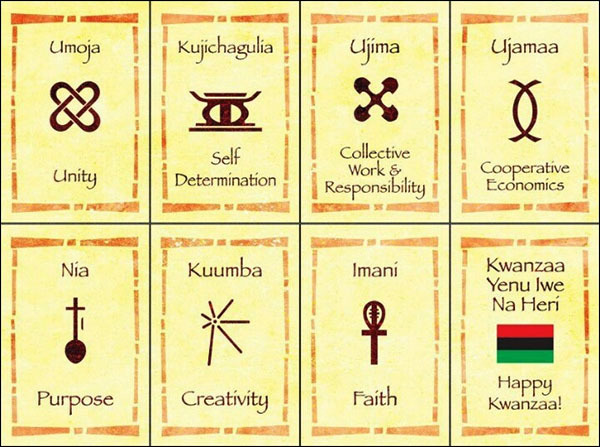 There are seven principles of Kwanzaa, which reflect the importance of community, while helping to create a better world. It’s no surprise that we at The Flag Shop can easily identify with these principles, which focus on community, social responsibility and creativity. 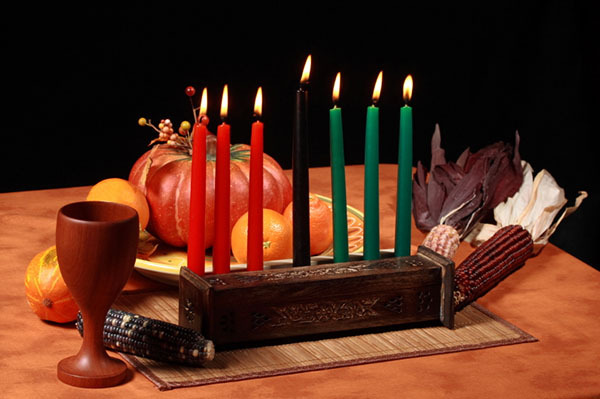 There are many symbols of Kwanzaa, including the unity cup, representing community; fruits or crops, representing productivity; seven candles, representing the seven principles, and the Bendera flag, made up of the colours black for the people, red for their struggle, and green for the future and hope resulting from the struggle. 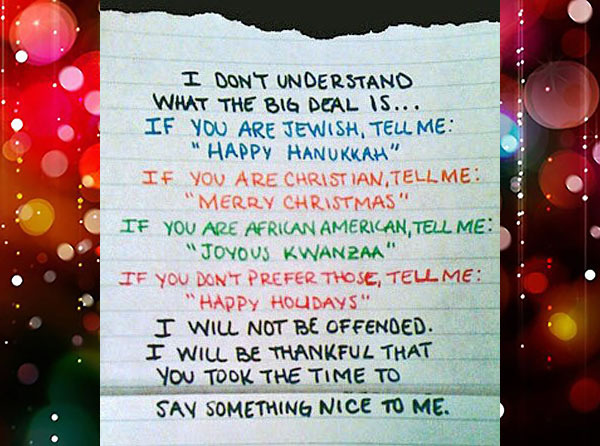 Joyous Kwanzaa! As we wrap up our series on holiday traditions and celebrations, we wish peace and joy to you and yours over the holidays, and the best of everything in 2018! We loved serving our community, clients, customers and friends throughout 2017, and we look forward to connecting again in the new year! 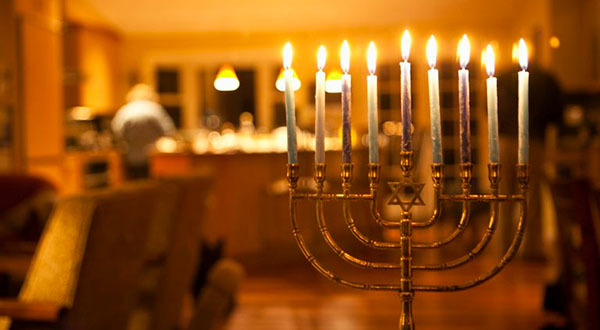 Hanukkah began at sundown on Tuesday, December 12 and ends today – Wednesday, December 20. During Hanukkah, each day, a candle is lit on a special menorah (candle holder) called “hanukkiyah.” The special ninth candle, traditionally the centre candle, is the “shammash” (servant candle) and is used to light the other candles. The menorah is often placed in the front window, displayed for others to see, and to remember the story of Hanukkah. Hanukkah is the Jewish festival of lights marking the rededication of the second Jewish temple in Jerusalem, which took place during the 160s BCE. Hanukkah lasts for eight days and is the Hebrew word for “dedication.” It begins on the 25th day of Kislev, which is the month in the Jewish calendar usually occurring around the same time as December. Growing up with a Jewish father, I can remember many special times celebrating Hanukkah. My dad came from a large family, and although I was not raised in the Jewish faith, I grew up being a part of many lavish gatherings full of friends and neighbours. Those who didn’t have family would join us – rabbis, shoemakers and doctors alike – to share the joy and peace of Hanukkah. 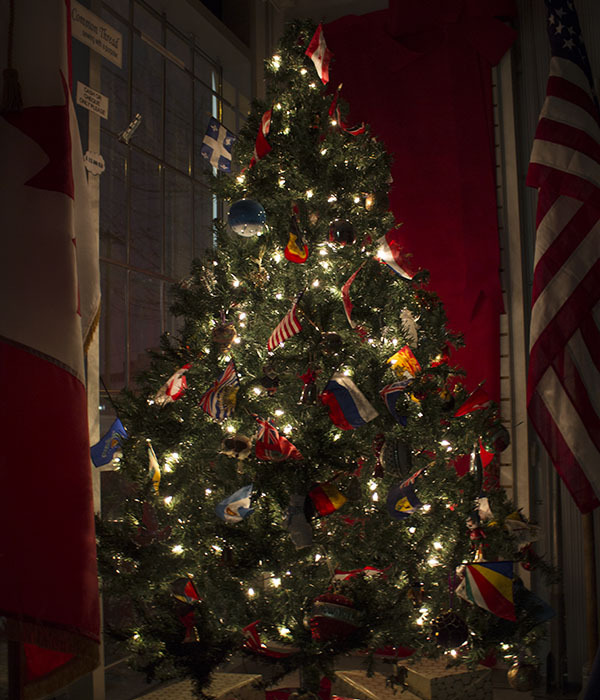 My dad’s extended family, including first, second, and third cousins would fly in from all parts of Canada and the US, and on the first night, my aunt’s or uncle’s house would be bustling with joy, laughter, love, and warmth. Even though I didn’t know many of the people, I felt so loved by these strangers. We were family. 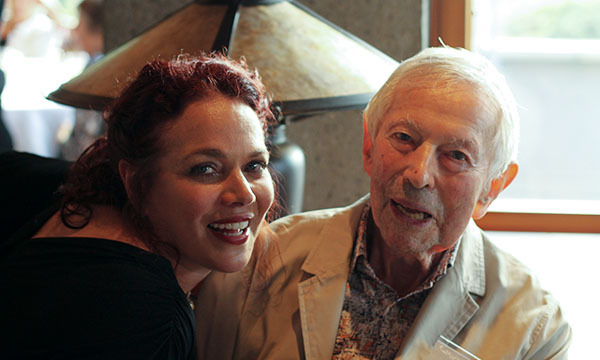 Me and my dad, Jack Braverman. This picture was taken in 2016 at my parents’ 50th wedding anniversary party. 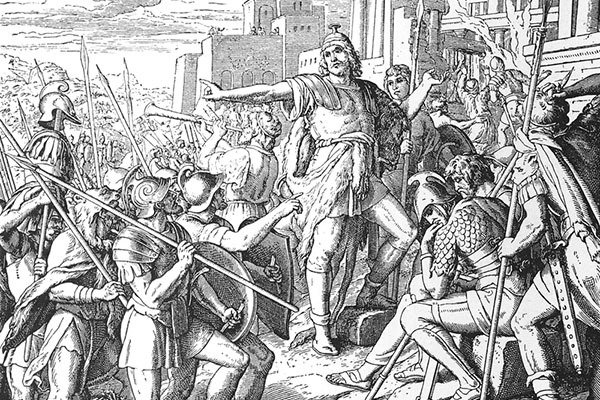 During the time of the second temple, the Holy Land was ruled by the Seleucid Empire, which robbed the Jews and set up idols in the temple. No one could take a stand against them until Mattityahu and his sons drove them out. The Hanukkah lights are reminders of the great miracle, that a small group of Jews were able to overpower the mighty Seleucid army. Even greater was the miracle of the oil. The Seleucid Empire had contaminated the oil in the temple, but the Maccabees (the Jewish warriors), found one single jar that had been untouched. Though this oil was only enough to burn for one day, the warriors lit it as an expression of respect for God, and it miraculously burned for eight days. During the Jewish festival of lights, gifts are often given on each night. It’s a time gathering with friends and family to play games and celebrate. 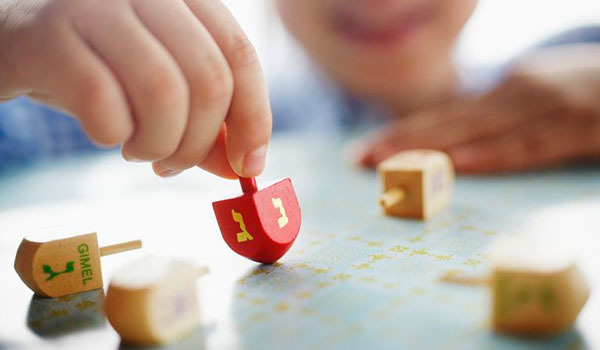 One popular game is “dreidel”, which is a four- sided top with a letter on each side. The four letters reflect “Nes Gadol Hayah Po.” Translated to English, this phrase means, “A great miracle happened here.” Each player places a coin in a pot and spins the top. The letter signifies how much or how little of the pot is won during each round. The importance of the oil in the Hanukkah story is remembered by preparing and sharing fried foods like “latkes” (potato pancakes) and “sufganiyot” (jam-filled doughnuts). For me, nothing says Christmas more than Christmas lights! 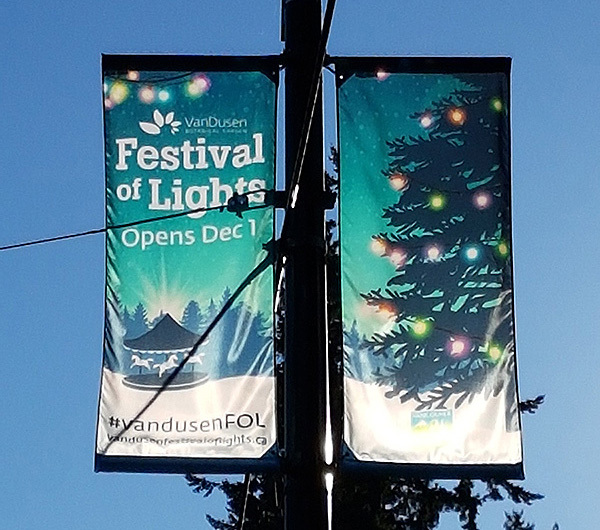 With that in mind, we couldn’t miss the opportunity to feature the VanDusen Garden Festival of Lights, which has always been a sign that Christmas is just around the corner! I have so many incredible memories of the Festival of Lights through the years, having attended since it began almost 25 years ago. When it snows in Vancouver, being at the Festival makes you feel like you’re at Santa’s house! 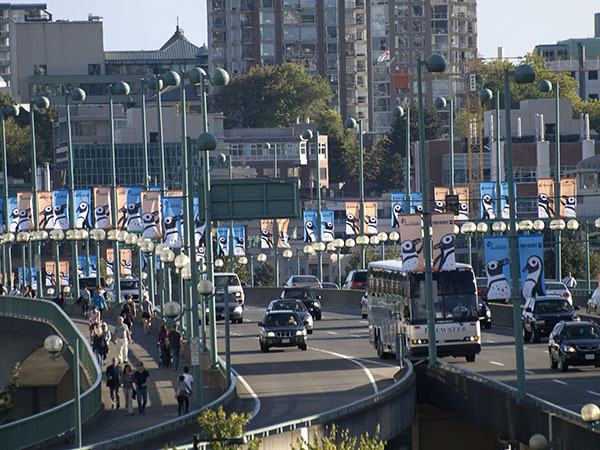 In the 90s, we helped create its banner program and made its first-ever street banners, so it’s very close to my heart. 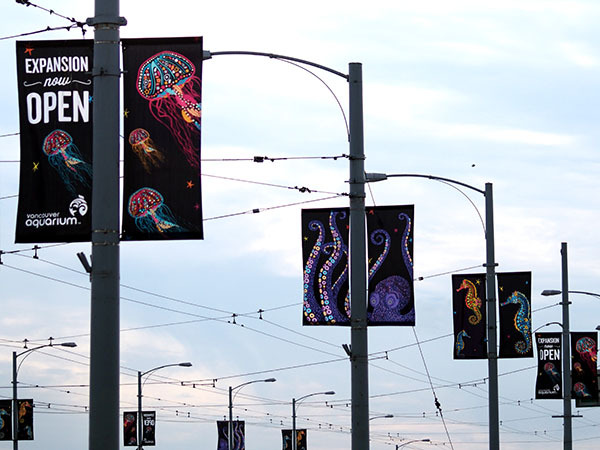 This year, we are thrilled to be a part of the excitement once again, having supplied over 50 festive street banners for the 2017 Festival of Lights. 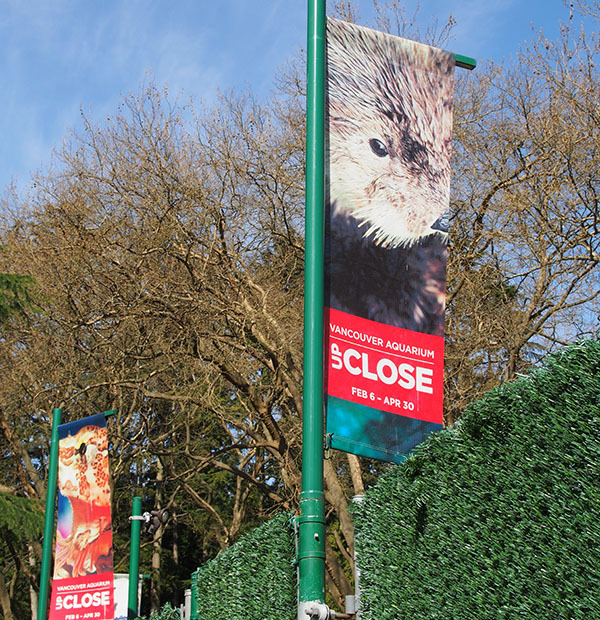 The banners are up on Oak and West 37th right outside of the Gardens, making the area even more beautiful, and signaling the beginning of the season of good cheer! 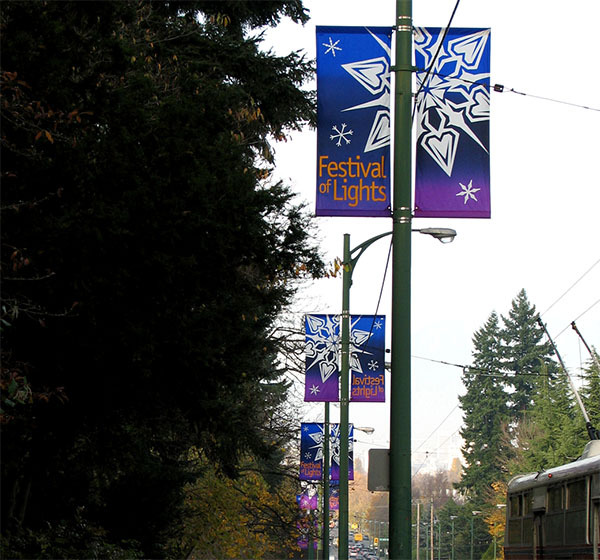 These were the very first Festival of Lights street banners we made for VanDusen Garden in the 90s. 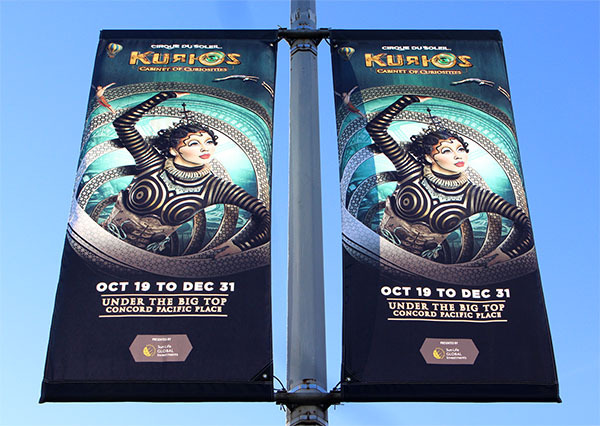 This year’s Festival of Lights street banners that just went up about a month ago. What else can bring on more holiday cheer than a ride on a carousel in a beautifully-lit setting? 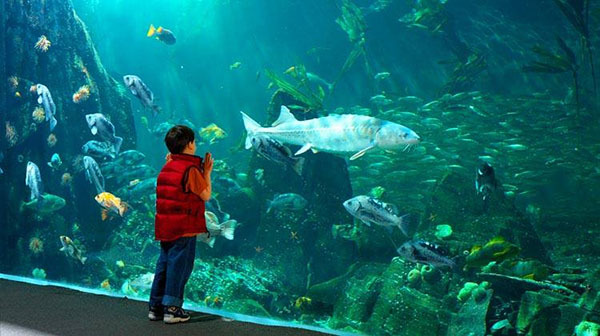 From grandkids to grandparents, it’s family fun for everyone because all tickets include a free ride on the carousel. Families, kids and couples alike can listen to holiday stories and take a selfie with Santa in the glasshouse until December 24. This is free, included with your entry ticket to the festival! Sing along to your favourite festive classics! Enjoy warm beverages while listening to singers, choirs, bands and entertainers inside the Visitor Centre halls. This area is now fully licensed. Gather around the fire pits and warm up with a holiday beverage in this new outdoor licensed area. Make a donation to the Festival’s charity partner, the Make-A-Wish® Foundation, and make a wish while you light a candle to fill this scenic grotto. In the Visitor Centre, learn about the Make-A-Wish® BC & Yukon, get a glow star with a minimum $5 donation and enjoy the Lego display! Let your kids have some fun making music with recycled instruments. Play the piano and sing along to holiday tunes in the garden. 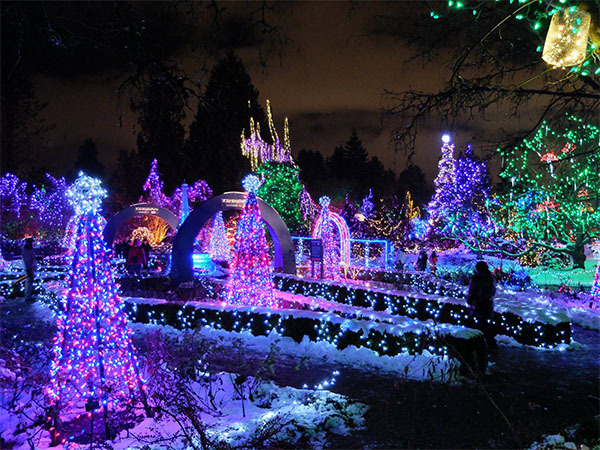 Earlier this month, the Vancouver Sun published its Guide to the BEST Christmas Light Displays in Metro Vancouver and it’s no surprise that the VanDusen Garden Festival of Lights is included! Check out the list, and if you think your lights have what it takes to be added, just follow the link to share! If your display makes it onto the list, please be sure to let us know! For more information about the 2017 Festival of Lights, please visit City of Vancouver’s website. 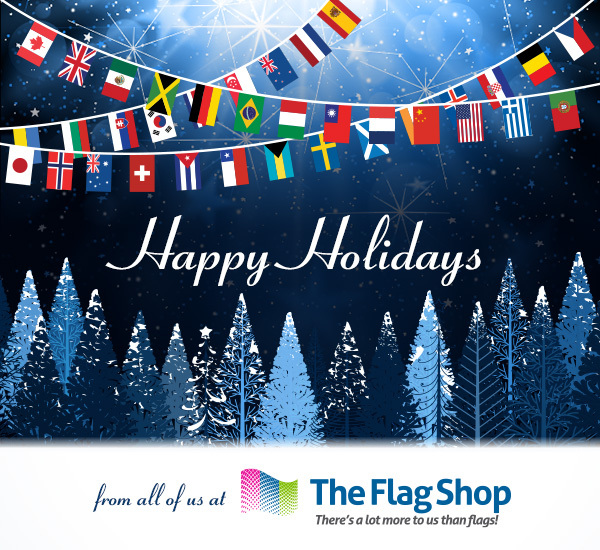 Stay tuned for more holiday traditions and observances as The Flag Shop’s series “Home for the Holidays” continues, next week with Hanukkah. L’chaim!